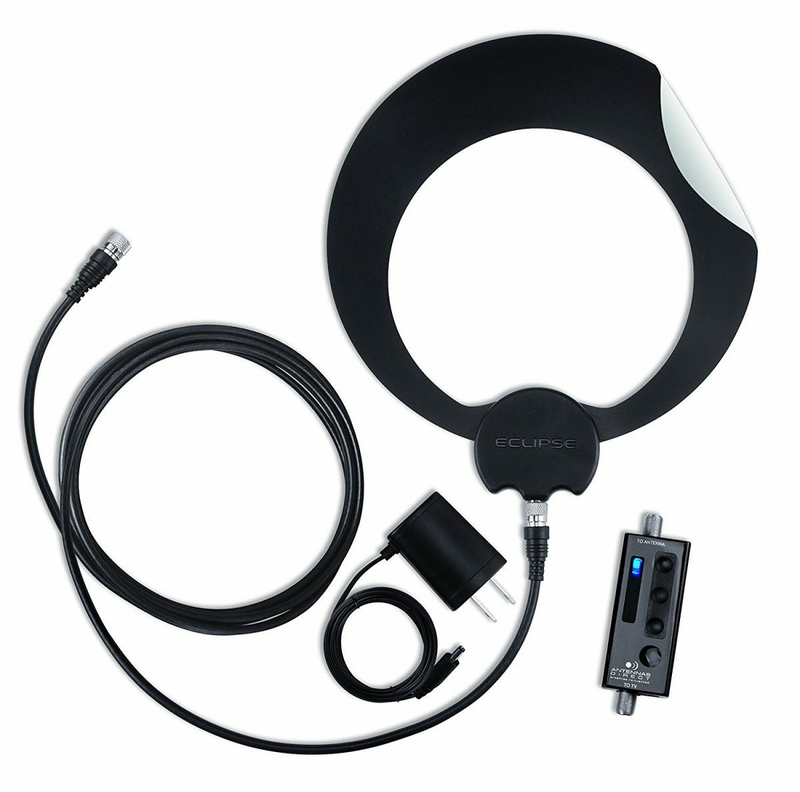 The cheapest way to cut the cord is to ditch cable and use an over-the-air antenna to watch local TV. Here are the best no-installation options for indoor antennas. OK, so technically you’re not literally cutting a cords here (you’ll still need to wire your antenna to your TV) but you get the idea: no more cable/satellite bills. Not only that, but you might be shocked at how good over-the-air broadcasts look. Even though cable companies offer local channels as part of their packages, they typically compress the video for those channels. Over-the-air video isn’t compressed to fit the bandwidth constraints of a cable line and looks much sharper. So what do you need? Indoor antennas work best in urban settings, especially if your home or apartment is within 25 miles of the broadcasting towers of all the local stations. Past 30 miles (48km) or so, you’ll begin to see some signal issues, and you may need to pick a strategic location for antenna placement like a window or an exterior wall. If you’re more than 40 miles (65km) away, you’ll definitely need to upgrade to an amplified antenna, which uses a standard electrical outlet to boost its reception capabilities. If you’re more than 50 miles (80km) away from the nearest large city, or there are significant physical obstructions between there like high terrain, you’re going to have to go with a more permanent outdoor installation. All TVs sold within the last ten years or so include a digital tuner, so you can just plug the antenna into the coaxial plug on the back; older CRT TVs and those without tuners will need a converter box. 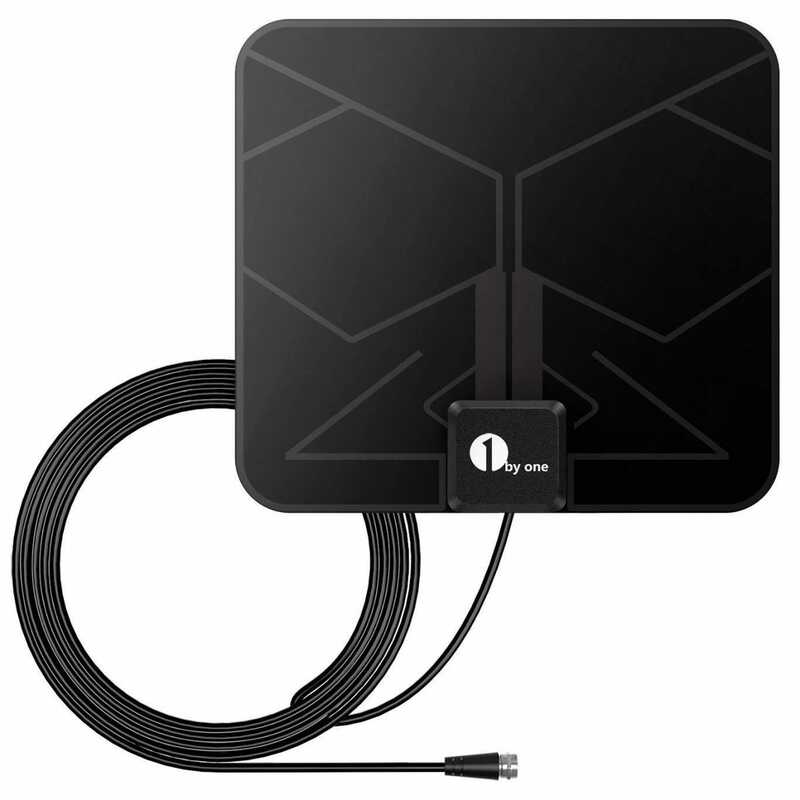 We’ve chosen the best indoor antenna models for typical users, for those with more demanding aesthetic standards, for those who need longer range, and for those on a budget. Anyone looking to cut the cord probably doesn’t want to spend that much on any extra hardware. 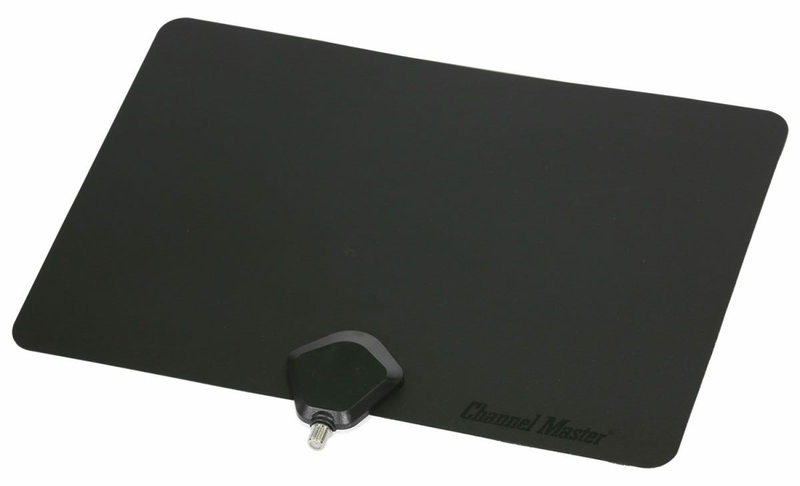 The Channel Master FLATenna obliges, with a time-tested plate design that needs no amplifier—just plug it directly into any HDTV. 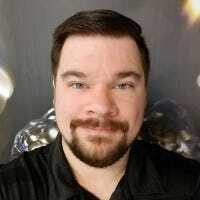 Though it costs just twenty bucks, it offers a few creature comforts that aren’t standard at that price, like a detachable cable and a reversible black-and-white design. Pair the white side with a white coaxial cable on a white wall, and it’ll be about as unobtrusive as it can be. The standard model FLATenna is good for 35 miles of range, meeting or beating other well-reviewed antennas at twice the price. If you’re at the outskirts of your metro area, your antenna might need a little extra oomph to pull in strong station signals. The ClearStream Eclipse is a solid pick in the first place, but pulls ahead of the pack in this bundle that adds a 20db in-line electrical amplifier. Plug it into an open spot on your media center’s surge protector, with the amplifier on the coaxial line, and you should be able to pull in TV signals from up to 50 miles away with no major obstructions. If you need anything longer, you’ll have to go for an exterior model. The circular antenna looks appealing on its own, but if you’d like something a little more subtle, it’s reversible with white or black faces that can also take standard indoor wall paint. What if you don’t want an electrical gadget sticking out like a sore thumb in your living room? This variant on ClearStream’s indoor design is for you. 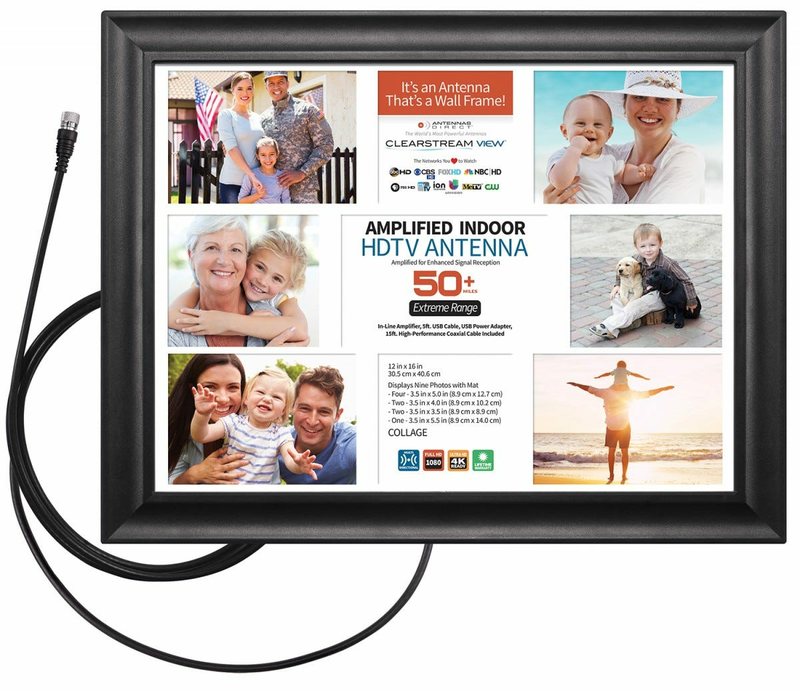 It hides the coils of the antenna inside a standard picture frame, allowing either a large 12×16-inch photo or print or a collage of nine smaller photos with the included insert. Hang the VIEW like a standard framed picture and match the cable to your wall’s paint and it’s practically invisible. The frame itself can be painted as well. The package isn’t cheap at $70, but it includes the same in-line amplifier as the Eclipse model if you’re on the outskirts of town, which you can leave disconnected if you don’t need it. 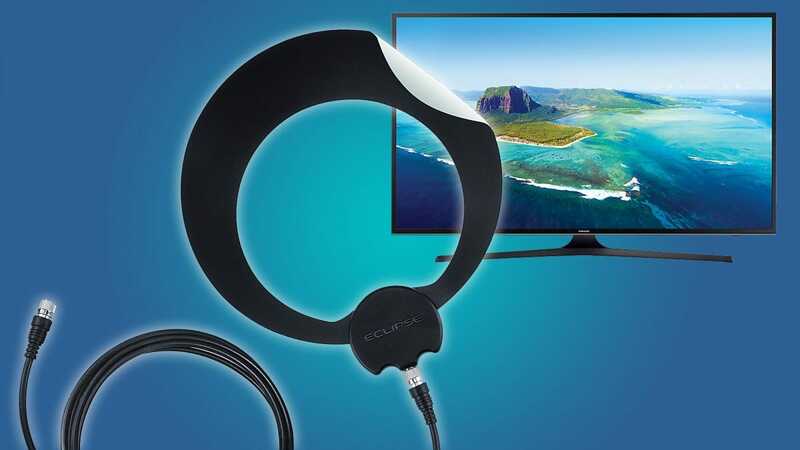 This basic antenna isn’t as flexible or as powerful as the other models on this list, but at just ten bucks, it’s a cord-cutting TV option that anyone can afford. The flat style isn’t reversible and you’ll have to make do with the 10-foot, non-removable cable (you can add a coupler and another coax cable if you need one), but it’s more than serviceable in any urban area. If you need a little more range without stretching your budget much further, an amplified upgrade costs just six bucks more, which should be good for up to fifty miles without any major obstructions to the signal tower. Whether you use your iPhone to track your workout, listen to music, or more, there’s a good chance it’s coming with you on a run or trip to the gym. These armbands and waist belts will keep it safe.